Aries and Sagittarius belong to the elements of fire, therefore in many ways similar and can get along well. Both love freedom and independence, have a passion for adventure and travel. Enthusiasm and the desire for impressions unite these two signs of the zodiac in a successful team in which the partners support and respect each other. Together they will never be bored, so two fires possess the liveliness of the mind, they adore to entertain and learn all new things. Gray everyday life can drive a pair of Aries-Sagittarius into despondency and melancholy. Problems in such a tandem can arise against the background of the propensity of both to fall into a fantasy world, forgetting about reality. The desire to be in the center of attention, vanity and love of Aries is inherent in Sagittarius, but only to a lesser extent. Aries is protected by Mars, endowing him with militancy, firmness of character and purposefulness. Sagittarius accompanies Jupiter, which determines its emotional instability, a tendency to go to extremes and frequent changes of mood. Both signs are temperamental and impatient, they want to receive everything at once, and in the face of difficulties they show aggression and perseverance. Compatibility of Aries and Sagittarius is successful in a variety of life spheres. Aries has a strong character, and they are looking for partners in partners. Sagittarius, possessing the same qualities, but to a lesser degree, more sensual and prone to empathy, just suits the first sign of the zodiac. Aries has developed physical strength and conquers people at the expense of his charisma, including. The Sagittarius takes its own, taking advantage of individuality and non-standard thinking. The wards of Mars and Jupiter are full of energy and love life. In each other they are attracted by honesty and openness, so the horoscope of compatibility of Aries with Sagittarius promises them a good relationship. Sagittarius is more willing to adapt to a demanding partner, if interested in a relationship with him. Uniting, two fires can multiply their achievements and results, so this tandem is beneficial to both of them. The compatibility of Aries and Sagittarius in work is highly effective. They are both industrious, hardy and endowed with creative imagination. 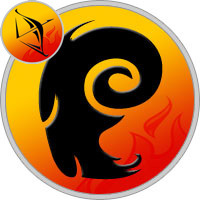 Aries has a flowing energy that he uses to achieve goals. Sagittarius is an excellent organizer and manager, takes on the most difficult work and always does it perfectly. In their working atmosphere, harmony prevails. Difficulties can arise in connection with the intolerance of both partners. Moreover, Sagittarius is more observant: more often sees and points out mistakes in their joint activity. Similar temperaments and energy promote the perfect compatibility of Aries and Sagittarius in friendship. They will never be bored together, because both are fidgeting and are constantly looking for something new and interesting. Sometimes their friendship adventure did not differ from children’s pranks — this contribute to the spontaneity and creativity of both signs of the zodiac. Both love active social life, they know how to give friendly support to a partner, and in case of danger they will protect each other to the end. Such friendship has all chances to exist throughout the life of fire signs. The compatibility of Aries with Sagittarius in love is at a high level. Aries, as a rule, is attractive and charismatic, falling in love he shows perseverance, seeking a partner in any way. Sagittarius also has an outstanding appearance and sexual attraction, carefully sorting out partners, chooses the best and worthy. These signs notice each other from afar, and often between them there are strong feelings, which lead to a strong and lasting relationship. Sagittarius is a light-minded and addicted nature, he is inclined to change partners often and honestly talk about it. But in this pair the probability of his betrayal is not high, since Aries is able to keep him next to him for a long time due to his creative nature. With such compatibility in relations, Aries and Sagittarius can not "feed" each other for a long time, leaving other aspects of life unattended. They are captured by romance and passion, which can deprive Aries of his self-confidence. This is due to the fact that Sagittarius, even being in love, does not lose his craving for freedom and independence, which makes the already jealous Aries go crazy. His sense of ownership, the desire to possess and control can lead to quarrels between them. The high compatibility of Aries and Sagittarius in bed is explained by the fact that both signs have passionate natures, eager for new impressions in the bed, including. At the beginning of the relationship, their sexual marathons can last infinitely long, so both are damn hardy, especially where there is an opportunity to have fun. Fire signs have increased sexuality, and their energy attracts many. But to withstand a passionate pressure not all are capable, therefore they approach to each other. Both are good lovers and know how to bring pleasure to a partner. Sagittarius brings to the sexual life of ideas, thanks to non-standard thinking, and Aries at the expense of its inexhaustible energy is able to implement them. The messenger of Mars wants to dominate even in intimate relationships, which Sagittarius is in principle happy, so its main goal is to get pleasure. Sagittarius, in general, has not a mere egoism, but in this situation Aries does not interfere in any way, as a satisfied and grateful partner is his reward. Compatibility of Aries and Sagittarius in a marriage can only be envied. They perfectly complement each other: Aries does not allow relations to cool, introduces innovation and impressions in them. Sagittarius often restrains the violent temper of his partner, and also is able to compromise and yield to the rebellious sign of fire. In this pair, there is support and mutual respect. They do not take dirty linen out of the hut, because the house and family are a great value for both, which they do not want to share with anyone. Such a marriage can last a lifetime, at least until both spouses support the fire of the family hearth, and boredom and dullness will not enter their lives. This can happen if both partners lose mutual interest in each other, and contribute to this will be a trivial routine. Then parting will be quiet — without scandals and finding out the relationship. The high compatibility of Aries with Sagittarius in family life is manifested in the common interests of a married couple: they like the same books and films, they prefer the same music, their spheres of activity are often similar, and friends, as a rule, are common. Between them there is no division into "yours and mine", and even after many years of living together their relationship is so filled with romance and care that strangers often take them for newlyweds.